This is our complete guide to the Botanical Research Center of Monster Hunter World. In Monster Hunter World, one of the most useful vendors you’re going to have is the Botanical Research Center, which can quickly generate multiple bugs, insects, and plants at once for you. In this Monster Hunter World Botanical Research guide, we’ll be walking you through how to get the most out the center for plants, as well as how to farm plants and insects quickly in MHW. 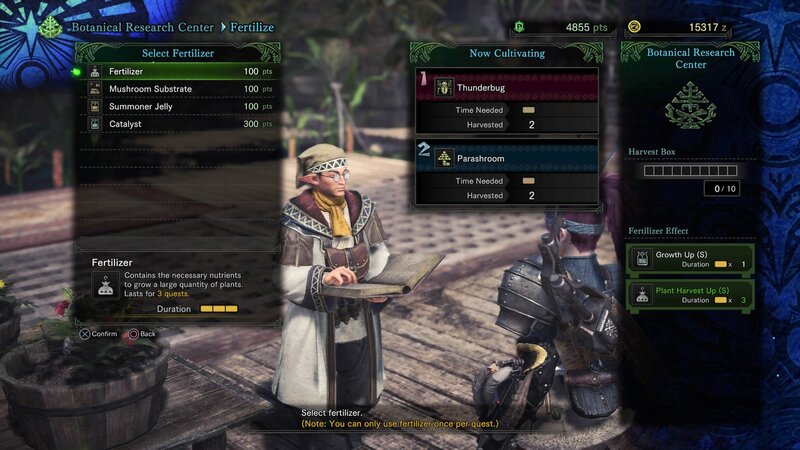 But if you instead need anything else at all on MHW, including how to quickly track down monsters with the Scout Flies, as well as how to perfectly cook a piece of meat on the BBQ, head over to our Monster Hunter World guides walkthrough hub. Every now and then while you’re exploring the MHW main hub area in Astera, you’ll see a character with an exclamation mark over their head, indicating that they require something of you. Not far into the game, the Chief Botanical Researcher, to the left of the Tradeyard Area where you spawn back into the hub after completing a quest or expedition, will call you over. Go and see the character, and the Botanical Research Center will now be available for use. What is the Botanical Research Center? Simply put, it’s a miniature farm where you can grow all kinds of plants and insects, to suit your crafting needs. As we detailed in our Monster Hunter World capturing guide, you’ll need Sleep Herbs and Parashrooms to craft a Tranq Bomb, used for capturing a monster. The Botanical Research Center is perfect for scenarios like this, where you find yourself a little short in ingredients that you need. 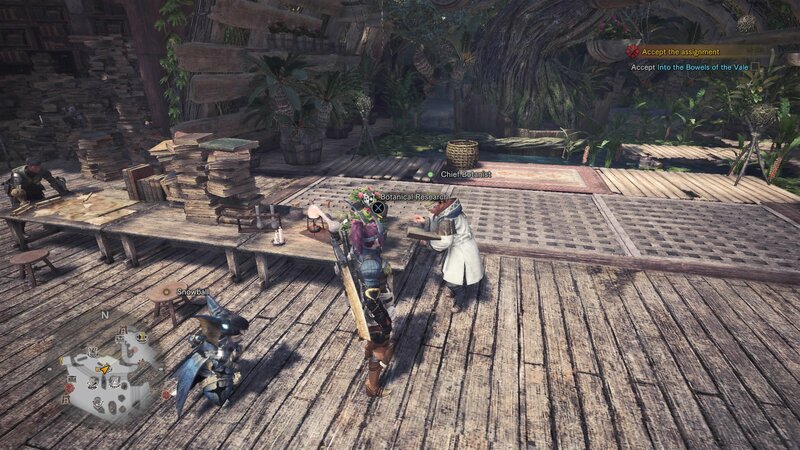 In order to put the Botanical Research Center to work in MHW, activate the menu for the center by walking up to the table where the Chief Researcher is standing by, and select the ‘Cultivate’ option. You’ll now have a complete list of bugs, insects, and plants that you can choose to grow. 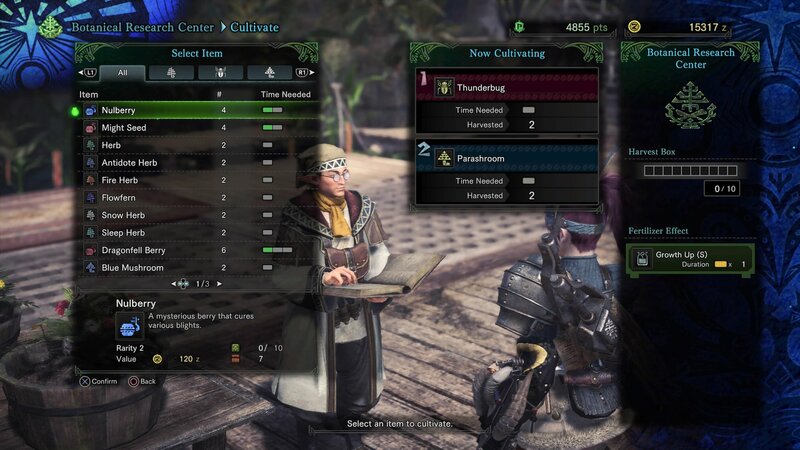 The first column over from the name of the item tells you how many of that item you’re going to get per harvest, and the ‘time needed’ column indicates how many quests you’re going to have to venture out on before you can pick up your cultivated items. For example, the Antidote Herb, used for crafting Antidote potions that can heal you of poisoning, will be ready for collection after one quest/expedition, and at that time two Antidote Herbs will be available for collection. Fertilizer (100 Points) - Increases quantity of plants, lasts for 3 quests. Mushroom Substrate (100 Points) - Increases quantity of mushrooms, lasts for 3 quests. Summoner Jelly (100 Points) - Increases quantity of insects harvested, lasts for 3 quests. Catalyst (300 Points) - Increases overall harvest speed, lasts for 4 quests. We’d recommend taking advantage of the Botanical Research Center as soon as you unlock it in Monster Hunter World. It’s the best way to quickly farm plants, insects, bugs, and more in the game, and you’ll undoubtedly need to put it to use for some rarer items at some point in the massive game. This concludes our guide to the Botanical Research Center, but why not check out some of our additional MHW guides, including how to take down the Zorah Magdaros, as well as our complete Wildspire Waste guide.